The path to success for most business owners is protecting their business, growing that asset, and exiting on their own terms. This is event is only available to Claremont Chamber Members. Lunch provided -- Limited Seating so RSVP today! Working with Tracy Haraksin provides you the unique opportunity to strategize for your success. Tracy, along with her professional team, will work with you to envision your financial future, then help you build towards that future. Tracy does this by showing you a clear picture of where you are today and listening to your concerns for tomorrow, to help meet all your financial goals. 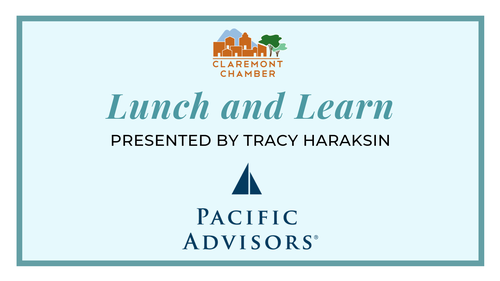 Hosted by Claremont Chamber of Commerce and Pacific Advisors. Maple Street, Suite 140, Ventura, CA 93003, 909-399-1100. Securities products and advisory services offered through PAS, member FINRA, SIPC. individual situations can vary. Therefore, the information should be relied upon only when coordinated with individual professional advice. Event is only available to Claremont Chamber Members.